Stephens Middle School and Cabrillo High School will join forces to present the Westside Pan Festival, a celebration of music for steel drums. The concert starts at 6:30 p.m. Wednesday, March 23 in the Cabrillo Auditorium. This year's concert will feature guest artists Joseph Peck and Chris Wabich. Peck has worked as a percussionist with Scott Weiland & Cyndi Lauper, while Wabich has played drums for Sting and Ludakris. Both performers have been collegiate steel band directors and are active studio session players. Tickets are $5 for individuals, and $15 for a family of three or more. 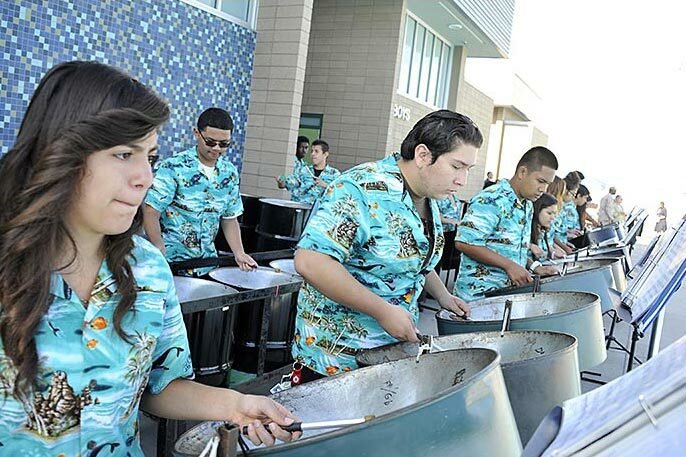 STEEL DRUMMERS – Members of Cabrillo High School's steel drum band perform at the school's dedication of an aquatic center in October 2013.